No, it's not gonna be the all-new, all-different Stick Cats or anything like that. So what is going to happen, you ask? I'm gonna mess with time. I recently completed Stick Cats Act I and ended things with a pretty big cliffhanger. But despite the shocking revelation I dropped, I'm not sure how I want to dive into Stick Cats Act II. However... I dig the notion of drawing Stick Cats Act III next. That means I'd go back and fill in the gap afterwards, making the end of Stick Cats Act II the end of the Stick Cats saga. 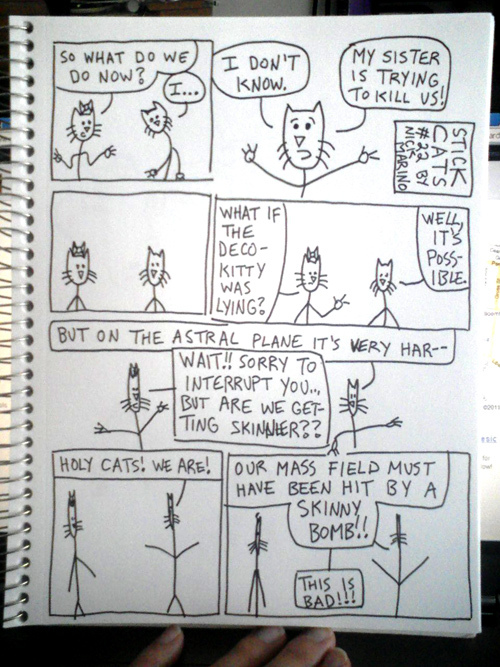 So when should you expect to see the start of Stick Cats Act III? Next week. I'm going to use 24-Hour Comic Day to knock out all of Act III (and, with luck, both the first and third acts will be available for purchase at this year's PIX on October 8-9). Obviously, I'm going to go in a totally different direction. But I thought you might like to see it anyway!